The Building Cognitive Applications with IBM Watson Services series is a seven-volume collection that introduces IBM® Watson cognitive computing services. The series includes an overview of specific Watson services with their associated architectures and simple code examples. Each volume describes how you can use and implement these services in your applications through practical use cases. Whether you are a beginner or an experienced developer, this collection provides the information you need to start your research on Watson services. If your goal is to become more familiar with Watson in relation to your current environment, or if you are evaluating cognitive computing, this collection can serve as a powerful learning tool. This IBM Redbooks® publication, Volume 3, introduces the IBM Watson® Visual Recognition service. The Watson Visual Recognition service uses deep learning algorithms to analyze images for scenes, objects, faces, and other content. This book introduces concepts that you need to understand in order to use this Watson service and provides simple code examples to illustrate the use of the APIs. 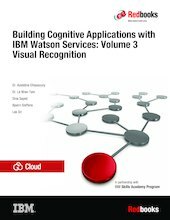 This book includes examples of applications that demonstrate how to use the Watson Visual Recognition service in practical use cases. You can develop and deploy the sample applications by following along in a step-by-step approach and using provided code snippets. Alternatively, you can download an existing Git project to more quickly deploy the application.